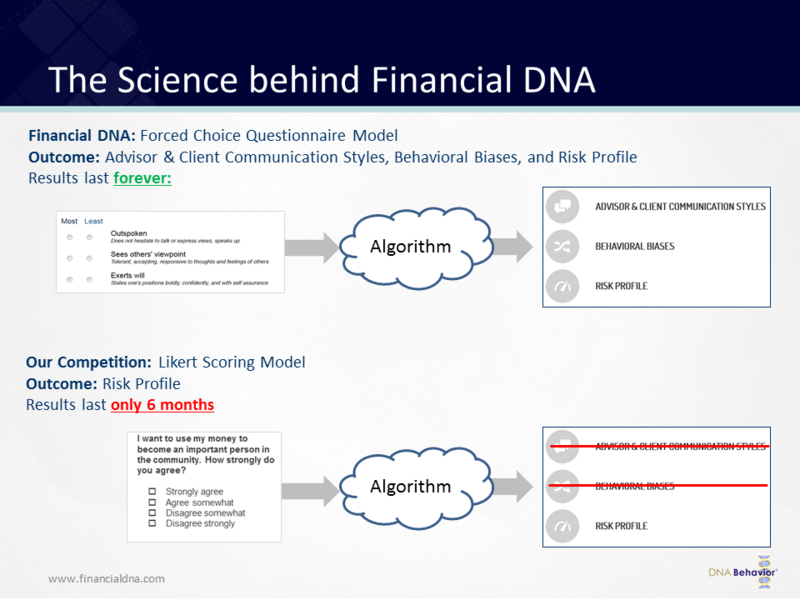 When our research team initially designed the Financial DNA platform, the overall objective was to build a system which would holistically uncover all dimensions of a client’s financial personality. It was important that the system firstly uncovers the client’s natural instinctive behavior which would reliably predict their long-term pattern of decision-making and would be their “go-to” style under pressure. Further, the assessment of behavior needed to be broad and deep enough to uncover a wide range of personality factors which would identify how clients make decisions (including their inherent biases), take advice, interact and build relationships, achieve results, handle information, manage budgets, develop trust, set and achieve goals, take and live with risks and learning styles. In finalizing our approach in April 2001, we conducted extensive research on which psychometric assessment model would be most dependable in terms of predicting deep rooted personal behavioral traits. Our research concluded that the use of a Forced-Choice (“Ipsative”) Assessment Format would produce the best results for discovering client Natural Behaviors and a separately used Likert Scale Format would produce the best results for discovering Learned Behaviors. All other “Fintech” Risk Profile solutions available in the market (back in 2001 and even today) use a Traditional Likert-type Scoring Model (Self-scoring in ranges of 1 to 5 or 1 to 7 as to how a particular situation would apply or use a True/False approach). The traditionally used questionnaire formats have been academically disproven to produce sufficiently accurate or reliable predictions of behavior. Other “FinTech” Risk Profiles available use a Likert Scoring model which allow for self-promotion and a higher chance of faking, which inherently inhibits their shelf life and accuracy (results of typical risk profile had ranging shelf lives of 6 months to 1 year). Independent academic research shows that Likert Model Risk Profiles overinflate the risk scores one standard deviation higher than under a Forced-Choice (ipsative) format. In the context of risk profiling, this level of inaccuracy could have a materially negative impact on a client’s investment portfolio. In conclusion, forced-choice measures don’t allow for self-promotion and will provide a more accurate reflection of a person’s life and finances, decision-making, strengths and struggles over longer time periods. Therefore, we believe that this approach must be the Platinum Standard for any process used for financial behavior discovery in preparing a financial plan and building an investment portfolio. If you would like to learn more about the meaningful contributions of the Financial DNA Advisory Program, please contact us.